Ali Farooq was the star in the Masterton Trophy, the Heriot’s tailender hitting an amazing three sixes in three balls in the last over to help his side win against Edinburgh in dramatic circumstances. The Goldenacre men travelled to Campbell Park on Thursday evening unbeaten in all competitions, but Edinburgh, from a division below them, did well to post 168-6 from their allotted overs in the Twenty20 clash. With nine wickets down and 15 needed from the final four balls in reply, Heriot’s looked in real trouble, but up stepped Farooq to smash the three maximums and see the visitors home. Mazars Grange and Watsonians also made it two wins from two in the round-robin stages, defeating Edinburgh Accies and Stewart’s Melville respectively. On Tuesday at Newfield, Grange again blooded some youngsters and came out on top by 59 runs in a 17-overs-a-side contest. 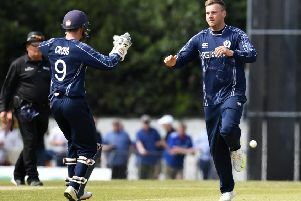 Two days later, 76 not out from Andrew Chalmers helped Watsonians post 164-2 at Inverleith and then teenager Callum Macleod took two wickets on his top-team debut in a 52 run triumph. RH Corstorphine got the better of Musselburgh on the same night, Freddie Young taking 3-2 in a 142 run win.